Sjoring Hard-Heart is a Nord drillmaster and the current leader of the Fighters Guild in Morrowind at their headquarters in Vivec's Foreign Quarter. Many members are concerned about the new direction the guild is taking under his command, and suspect him of having ties to the Camonna Tong. He is also Radd Hard-Heart's brother. Sjoring wears a common shirt with matching pants and carries a steel cuirass with matching greaves, pauldrons, gauntlets, and boots. He wields a steel warhammer of smiting. Aside from his natural resistance to shock, immunity to frost, ability to shield himself, and a natural frost damage spell, he knows no spells. Remove the Heads of the Thieves Guild: Kill the Thieves Guild bosses. 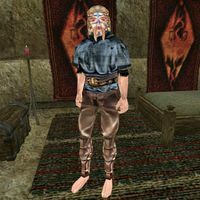 Kill the Master Thief: Kill the Main Boss of the Thieves Guild, 'Gentleman' Jim Stacey in Vivec. Kill Hard-Heart (Fighters Guild): Kill the Master of the Fighters Guild in Vivec. Kill Hard-Heart (Thieves Guild): Kill the corrupt Master of the Fighters Guild in Vivec. "Until you earn a better rank, you'll take your orders from my Champion, Lorbumol gro-Aglakh." "I've watched your progress in the Fighters Guild, %PCName. You'll make a fine Guildmaster someday. But with all the unrest in Cyrodiil city, we need allies to make sure there's still a Fighter's Guild here for you. I need you to kill the Thieves Guild bosses." "Just kill the Thieves Guild bosses like I told you. Then we can talk about the future of the Fighters Guild." "You did quite a job on the local heads of the Thieves Guild. Now it's time to take care of the Master Thief in Vivec." "In Sadrith Mora, kill Helende at Dirty Muriel's Cornerclub. Feel free to kill any other thieves there. In Balmora, the Thieves Guild there is the South Wall tavern. Kill Habasi the Khajiit. Then go to The Rat in the Pot in Ald'ruhn and kill Aengoth. When the Thieves Guild bosses are dead, talk to me again. Here's some gold to deal with the guards." "As I told you, in Sadrith Mora, kill Helende at Dirty Muriel's Cornerclub. Feel free to kill any other thieves there. In Balmora, the Thieves Guild there is the South Wall tavern. Kill Habasi the Khajiit. Then go to The Rat in the Pot in Ald'ruhn and kill Aengoth. When your work is done, come see me." "Good work, %PCName. I'm making you my second in command. Now our allies want us to take care of the Master Thief himself." "What? You already killed the bosses of the Thieves Guild? You deserve the rank of %NextPCRank even more than I thought. Congratulations, %PCName, I'm making you my second in command. Now we need to take care of the Master Thief himself." "The small guild bosses are dead, but the Master Thief still lives." "You've been expelled, %PCName. You must make amends before I'll discuss Guild matters with you." "First you need to advance to the rank of Champion." "The Master Thief and his second-in-command are in Simine Fralinie's bookstore. Get rid of Gentleman Jim Stacey, the Redguard. He's in charge. I wouldn't mind if you took out his lackey as well. Once you have crippled the Thieves Guild, I will make you the new Guildmaster and retire." "I hear you killed the Master Thief. Great work, %PCName. Thanks for taking care of the Thieves Guild for me. Now the only one who can threaten my position...is you. You showed promise, but a bit too much ambition. You will not be missed." "What? You're the Master Thief? Well, why didn't you say so from the start? Tell you what, %PCName, between you and me and Camonna Tong, we've got a good deal here. Let's start by you telling me everything you know about the Thieves Guild operations in Vvardenfell." "That's too bad, %PCName. We could have worked together. Instead, you'll die alone." "That information will help a great deal when I take over the Thieves Guild and the Camonna Tong myself. Now who's the "Master Thief," %PCName?" ^ The Morrowind Prophecies: Game of the Year Edition Official Strategy Guide, p 162. Radd Hard-Heart section. This page was last modified on 15 November 2018, at 18:52.